This is the second part of my LTE adventures blog series. Don't worry, this is the last part. Read part one here. After playing with the Pantech UML290 until I was blue in the face, I decided that I wasn't going to get anywhere with IPv6. I needed to backtrack. 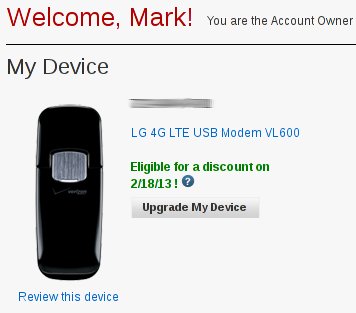 I suspect the presence of a different ESN or IMEI automatically updated the device on my account. Anyway, no hassle. As expected, IPv6 worked again on OS X and Windows with the VZAM software. So, giving up on IPv6 for a little bit, I turned my focus back to integrating the VL600 into my home network. I picked up an ALIX.2D13 board and case to be used exclusively for the LTE connection in my condo. After installing Debian (ok, not really installing, I cheated and dd'ed an existing install from one of my Soekris boxes onto the new CF card), I turned up routing and terminated a VPN on the LTE interface, providing a [fast] backup to my existing cable modem connection. With a few tweaks, I was able to seamlessly move Internet and VPN traffic between my cable modem and the LTE connections. Since I'm using Quagga and run BGP on my network, swinging VPN traffic is as easy as just swapping out a route map with a more appropriate one. Moving IPv4 Internet traffic is more bumpy, since the source IP will change (double NAT, woot! ), but is as simple as reloading the iptables script on my core router to policy route all traffic toward the ALIX box. I still routinely hit the spoofing bug, since iptables will "leak" sometimes and spill a packet with an untranslated source out the LTE interface. This is probably something I'll have to look into eventually, but for now I was happy. View the live graph here. Recently, I was getting annoyed with the lack of IPv6 on Linux with the VL600, and a bug cropped up in kernel 2.6.39 that nuked the VL600's functionality. I sent an e-mail to Andrew Zaborowski, the original author of the VL600 Linux driver, and asked what he thought of the two problems. Unfortunately, as his blog indicated, he was only in the United States on a trip, and wasn't able to continue development of the driver in Europe, where the VL600 serves only as a nice paperweight. I managed to resolve the 2.6.39 problem fairly easily, as it was a one-line fix. The lack of IPv6 support took some more thought, and lots of debugging, but I managed to figure it out. The key ended up being a problem with the ethertype of the Ethernet frames containing IPv6 packets. From Andrew's comments in the driver, I was well aware that the VL600 didn't follow the 3GPP specifications very well, but apparently this was just the tip of the iceberg. 0x0020:  0000 0000 0000 0001 8600 ed45 ff40 ffff  ...........E.@..
0x0020:  5000 0000 0800 6000 0000 0028 3a80 2600  P.....`....(:.&. 0x0030:  1004 b005 726c 6699 5dff fef7 c054 2001  ....rlf.]....T.. 0x0070:  6465 6667 6869 0000                      defghi..
0x0020:  5000 0000 0800 6000 0000 0028 3a2f 2001  P.....`....(:/..
0x0030:  1998 2001 0301 0000 0000 0000 1002 2600  ..............&. 0x0040:  1004 b005 726c 6699 5dff fef7 c054 8100  ....rlf.]....T.. Anyway, the above output was the result of me running a PING to an IPv6 host on the Internet from the VM. Bytes 37 and 38 clearly show 0x800 as the ethertype. Looks invalid to me, but the OS itself sees the right ethertypes. I figured the driver must be peeking in the L3 header and changing frames containing IPv6 packets to have an ethertype of 0x86dd. Why the heck is LG doing this? It seems retarded, but after some trial & error, I got lg-vl600.c to perform the necessary conversions, as well, and it only took a few lines of code. So, success! I'll probably try to fix the autoconfiguration problem a little later, but I have a feeling it's something Linux sysctl-related rather than driver or network-related. You can grab the patch here, for now. I'll be opening up another kernel bugzilla ticket to get this into mainline in the next day or so, too.